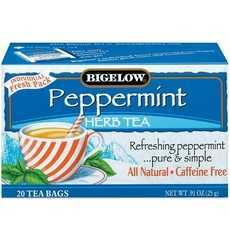 Enjoy Bigelow Herbal TeaPeppermint. Individual Fresh Pack. A Refreshing Herb Tea With The Cool Taste Of Peppermint. No Caffeine. All Natural. Special Fresh-Pack Locks In Flavor. For Three Generations The Bigelow Family Has Specialized In Creating A Variety Of Deliciously Different Teas And Herb Teas. Our Individually Overwrapped Tea Bags Ensure That The Last Cup Of Tea You Have From This Box Is Just As Delicious As The First. Each Tea Bag Is Individually Sealed In A Foil Packet. Blended And Packaged In The U.S.A. (Note: Description is informational only. Please refer to ingredients label on product prior to use and address any health questions to your Health Professional prior to use.